The good news is, a new build of Chrome OS has been released and is making its way to a wide range of Chromebooks. The not-so-good news, it doesn’t enable Android apps in the Stable channel yet. Here is the deal: Chrome OS build 56.0.2924.87 (Platform version: 9000.82.0) is rolling out to all devices except those devices which are already able to run Android apps. That includes the ASUS Chromebook Flip C100PA, Google Chromebook Pixel (2015), and the Acer Chromebook R11. If you have any other device running the platform, the update is rolling out and should hit your device via an OTA update in the next day or two. You can force the update by going to Settings>About Chrome OS and checking for an update. However, don’t despair: There are some really nice updates in this build, especially around Material Design. been doing with indicators in Android apps. Probably the most noticeable change is with the System menu. It is a single, clean sheet now without the obvious buttons to click to go to deeper settings (like showing a list of Cast devices). 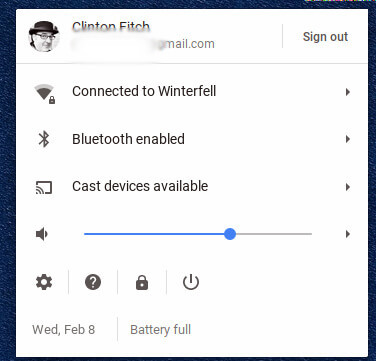 For those who use Accessibility settings, ChromeVox screen reader is now the default screen reading service across all Chromebooks. Finally, the Flash Component Updater has been updated in this build. The big question, of course, is when are Android app coming to the Stable Channel? That is hard to answer as it was expected in the 56 train. It could still happen with smaller updates later in the month.